In the early hours of January 16, an officer observed a vehicle travelling on Harvard St. who failed to dim their high beams with the approach of an oncoming vehicle. The officer conducted a traffic stop and the driver was unable to provide his registration, license, or any identification. It was discovered that the driver had provided false information to the officer and a BOP query showed that the driver had a suspended driver’s license and an active straight warrant. The driver was placed under arrest and charged with failure to dim high beams to oncoming traffic, providing false name/DOB to police officers, and operating a MV after license suspension. On January 16, an officer observed a vehicle on Sherrin Rd. that was running with its parking lights on. The two occupants appeared to be acting suspicious and when they exited the vehicle, the officer approached them and asked for their ID’s. During the interaction, the officer detected an odor of marijuana and nervous behavior. One of the men was found to be carrying marijuana and was cited for possessing less than 1 oz. of marijuana. On January 16, an officer responded to a report of larceny at a building on Heath Street. A woman spoke to the officer and stated that a wallet had been stolen from a resident’s purse which she keeps in her living room. The same woman had reported her wallet stolen out of her room in December. On January 16, officers responded to a home on Winslow Rd. for a report of a loud party. Officers spoke to two residents of the home who were underage and entered the home to investigate more underage drinking. Officers witnessed 50-70 people, 3 kegs of beer, multiple bottles of vodka, and a small baggy of marijuana all in plain sight. Both residents were issued Town By Law citations for violating the Town’s Nuisance Ordinance and will be charged with minor in possession of alcohol and disturbing the peace. One of the residents is being cited for possession of less than one ounce of marijuana. On January 15, officers responded to a building on Freeman St. for a complaint of people smoking marijuana. Upon arrival, the smell of burnt marijuana was evident in the elevator and there was a haze of smoke in the hallway. When a resident came to the door, the officers were able to see multiple jars of a green leafy substance in plain sight. The officers entered the apartment and advised all four parties of their rights. The matter is currently under investigation. 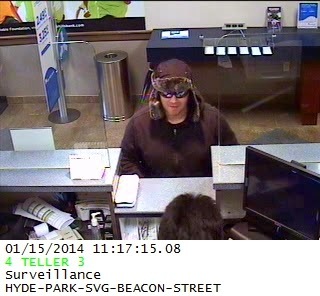 On January 15, officers responded to an alarm from Blue Hills Bank on Beacon St. where a robbery had occurred. A man had entered the bank and approached one of the tellers at which point he pulled out a note and demanded money. The suspect was described as a white male in his 30’s with an average build. 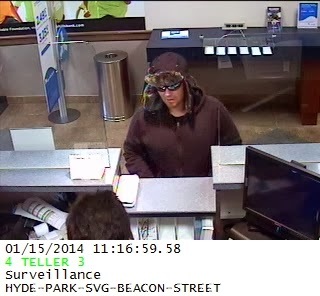 He wore large dark sunglasses, a dark tan coat, a hat covering his head and ears, and heavy gloves. If you have any information in regards to this case, please contact the Bank Robbery Task Force (617-742-5533) or the Brookline Police Department (617-730-2222). On January 14, an officer was flagged down by a motorist who wanted to report an accident. The man stated that he had witnessed a vehicle driving on a traffic median and hitting a sign before driving off on Boylston St. The man had followed the vehicle to the Cleveland Circle and gave officers the license plate number. Officers verified the incident and got in contact with the driver. On January 14, a vehicle making a left turn from Beacon St. to Marion St. hit a pedestrian who was walking in the crosswalk. The pedestrian refused assistance from the paramedics and was taken home and the driver was issued a citation for failure to stop for a pedestrian crosswalk. On January 14, an officer responded to a report of a motor vehicle accident. The victim stated that as she crossed the crosswalk at Tappan St. and Blake Rd., a vehicle made contact with her right elbow. The operator of the car pulled over and tried to talk to the victim and then drove off when she didn’t answer. The victim sought medical care and the operator of the vehicle has not been located. In the early hours of January 13 an officer observed a vehicle speeding on Boylston St. and initiated a traffic stop. An RMV check showed that the vehicle’s registration had been. The driver was cited for operating after revocation, operating an uninsured motor vehicle, unregistered motor vehicle, and speeding. On January 13, a woman reported a possible phone scam. The woman stated that she had been called by an unidentified individual who claimed that her brother had been in a car accident. The caller then asked for the brother’s personal information but when he was unable to give descriptive details about the brother, the woman hung up. On January 13, a woman reported an incident of fraud. A business on Commonwealth Ave. had received a call from a NStar disconnect service stating that they owed money. Believing it was a scam, the woman hung up. On January 13, a man received a call from an unidentified caller stating that his brother had been in an accident with the caller’s brother. The caller stated that they were holding the man’s brother hostage. Knowing the location of his brother, the man hung up. On January 13, an officer initiated a traffic stop for a vehicle lacking a current inspection sticker. Standing next to the vehicle, the officer could detect an odor of raw marijuana. It was found that the passenger had a small bag of marijuana on him. He was cited with possessing less than an ounce of marijuana and failing to use a seatbelt while the driver was cited for failing to submit vehicle for inspection. In the early hours of January 10, an officer observed a vehicle speeding on Boylston St. and initiated a traffic stop. Upon discovering that the operator’s license was suspended, the driver was taken into custody. On January 10, a van was observed travelling through a stop sign at the intersection of Freeman and Babcock streets. An officer conducted a motor vehicle stop and discovered the operator’s license to have been expired for several years. The driver was taken into custody and cited for failure to stop and operating without a license. 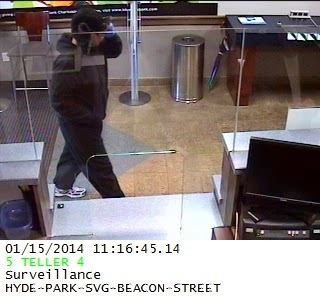 On January 10, a man came to the Brookline Police Department to report a case of fraud. Two weeks prior, the man had found a listing on Craigslist for a personal assistant and was hired by an unknown party over the phone. The man was mailed a check and told to deposit it into his personal account. He was then instructed to withdraw money for a donation to an unknown person and go to Walmart to purchase 2 MoneyPak cards and pass along the pins on the back to the unknown party. The man was sent another check which he tried to deposit and which caused him to learn that the first check had not been valid. The man was unsuccessful in reaching the unknown party and realized he had been the victim of a scam. On January 10, officers were dispatched to a business on Harvard St. for a report of shoplifting. The reporting party told officers that he had attempted to stop the suspect as he left through the rear door and that the suspect had placed the items on the ground inside the store before leaving. The reporting party informed the officers of the suspect’s current location and they placed him under arrest for shoplifting. During the inventory search, officers found heroin on the suspect and also charged him with possession of a Class A drug. On January 11, an officer traveling on Boylston St. observed a vehicle speeding and conducted a traffic stop. Upon speaking to the operator, the officer observed that the driver had glassy and bloodshot eyes, slurred speech, and there was a strong odor of alcohol. The driver handed over the vehicle registration and a Mass identification card. After looking up the driver, the officer found him to be driving with a revoked license and having a warrant for possession of burglarious instrument and larceny. The driver was placed under arrest for operating under the influence of alcohol. On January 11, a vehicle was observed repeatedly crossing the double yellow lines on Chestnut Hill Ave. and was pulled over. Upon arrival at the vehicle, the officer observed the operator as having bloodshot and glassy eyes and an odor of alcohol. The driver was taken into custody for operating under the influence of alcohol. On January 11, officers responded to a restaurant on Beacon St. where an alarm was going off. Officers discovered that one of the front windows had been smashed and a brick was lying inside. Officers were unable to contact the business owner. On January 11, a man reported that his jacket, phone, wallet, and keys had been stolen. The man stated that his possessions had been taken when he had left them on a fence while running up and down Summit Ave.
On January 11, a woman reported that her handicap placard was taken from her car while it was parked at the Centre St. parking lot. On January 11, an officer was dispatched to the Panera Bread on Harvard St. for a report of larceny. The reporting party told the officer that he had placed his bag over the back of a chair before joining the line by the counter. Upon return to the table a few minutes later, the bag was gone. The messenger bag contained a laptop and iPad as well as some paperwork. On January 12, an officer observed a vehicle speeding on Harvard St. and failing to stop at a red light. The officer conducted a traffic stop. Once the officer approached the vehicle and the driver rolled down their window, a strong odor of marijuana was detected. A search of the vehicle yielded a large bag of marijuana and the driver was placed under arrest for speeding, red light violation, operating to endanger, school zone violation, and possession of a Class D with intent to distribute. On January 12, an officer observed a vehicle on Beacon St. make an illegal left turn onto Washington St. The officer initiated a traffic stop and discovered that the driver was operating with a suspended license and the driver was placed under arrest. On January 12, officers arrived on Beacon St. for suspicious activity. The investigation led to arrests for possession of heroin, possession of marijuana with intent to distribute, and prostitution.